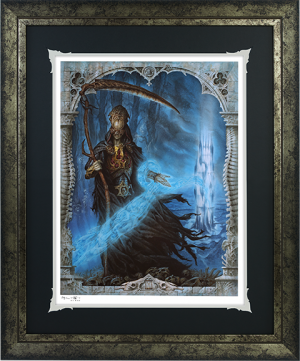 Sideshow is proud to present the Death Welcomes You Fine Art Print from our original dark fantasy horror property, Court of the Dead. 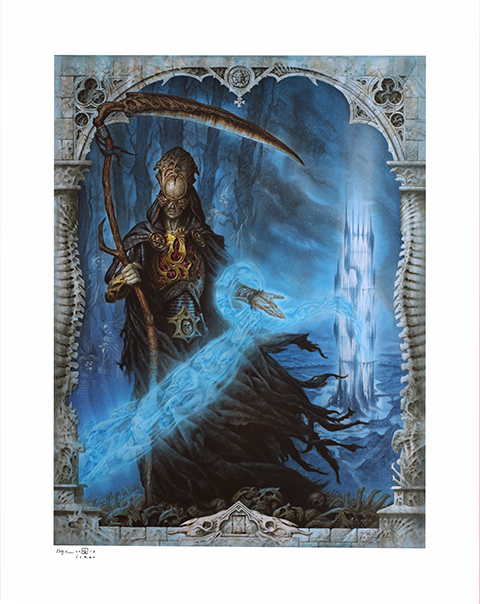 Painted traditionally by the talented Milivoj Ceran, the Death Welcomes You Fine Art Print depicts the Alltaker ushering a few fortunate souls into the Underworld, saving them from ending up as foot soldiers in the endless battle between the equally corrupt and power-hungry realms of Heaven and Hell. 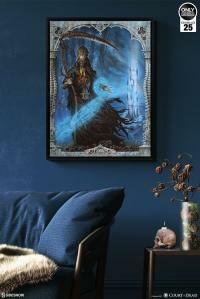 This bright yet moody master work features a unique border of Underworld architecture. Each Death Welcomes You Fine Art Print features an authorized, automated pencil signature and an embossed Court of the Dead seal of authenticity as a part of the limited edition of 100 pieces. Let Ceran’s epic masterpiece guide you along an ethereal wave into the Underworld with the Death Welcomes You Fine Art Print! 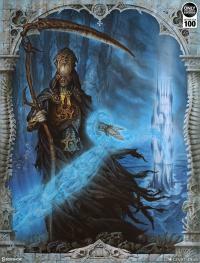 Born in Croatia, Milivoj Ceran has been working as a professional illustrator since 2002. 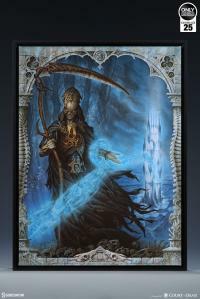 His career began in the children's book market, and soon transitioned into high fantasy. 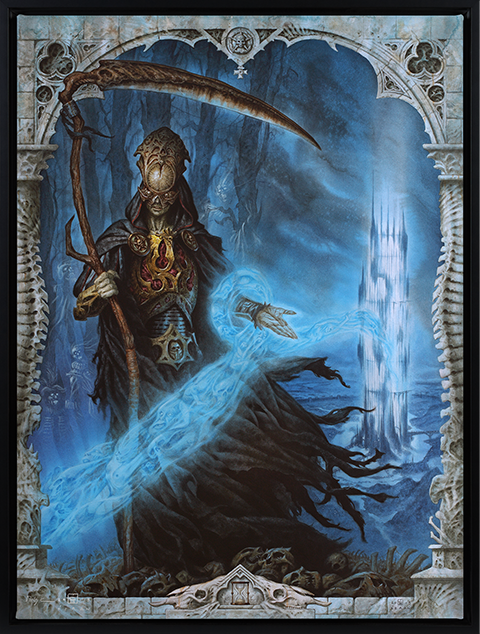 He has been working with Tom Gilliland and the Court of the Dead team since the summer of 2018, where their paths crossed at Gen Con in Indianapolis. 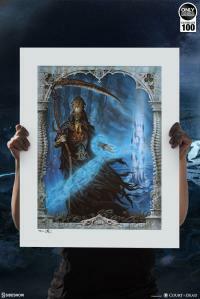 Born in Croatia, Ceran has been working as a professional illustrator since 2002. 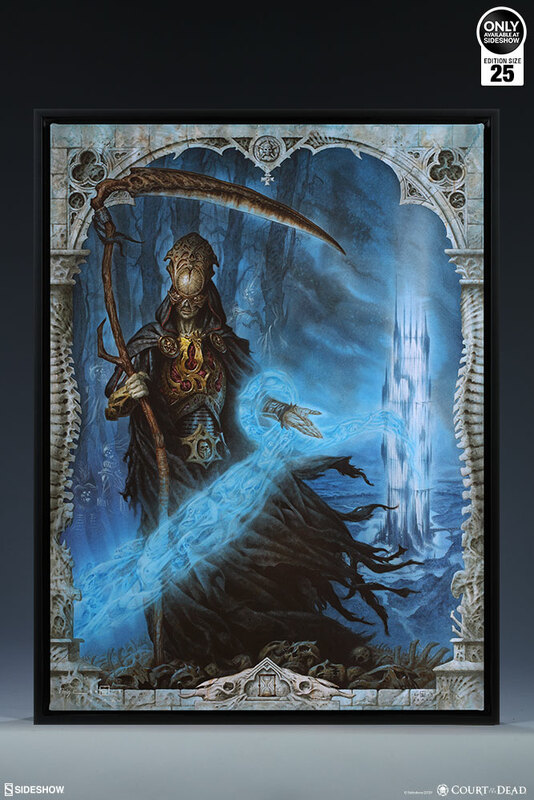 His career began in the children's book market, and soon transitioned into high fantasy. 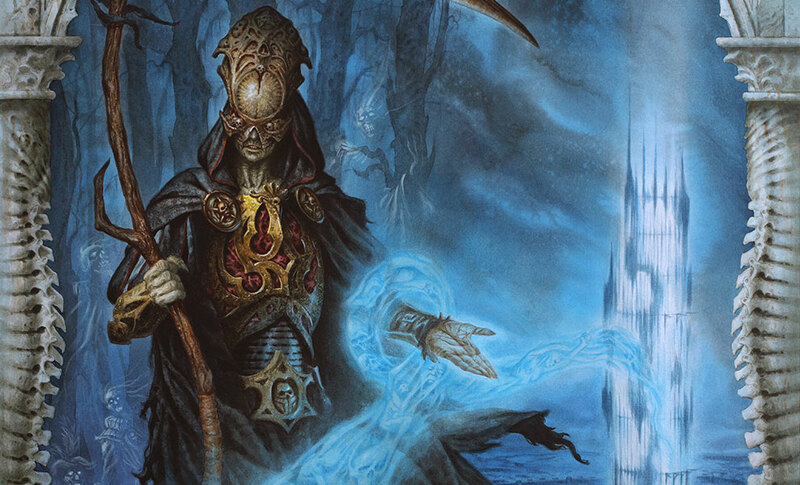 He has been working with Tom Gilliland and the Court of the Dead team since the summer of 2018, where their paths crossed at Gen Con in Indianapolis. 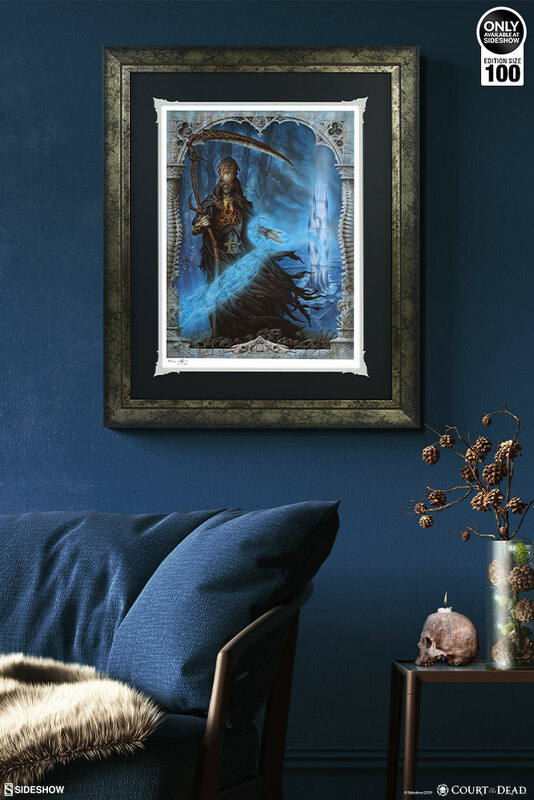 Each Death Welcomes You Fine Art Print features an authorized, automated pencil signature and an embossed Court of the Dead seal of authenticity as a part of the limited edition of 100 pieces. 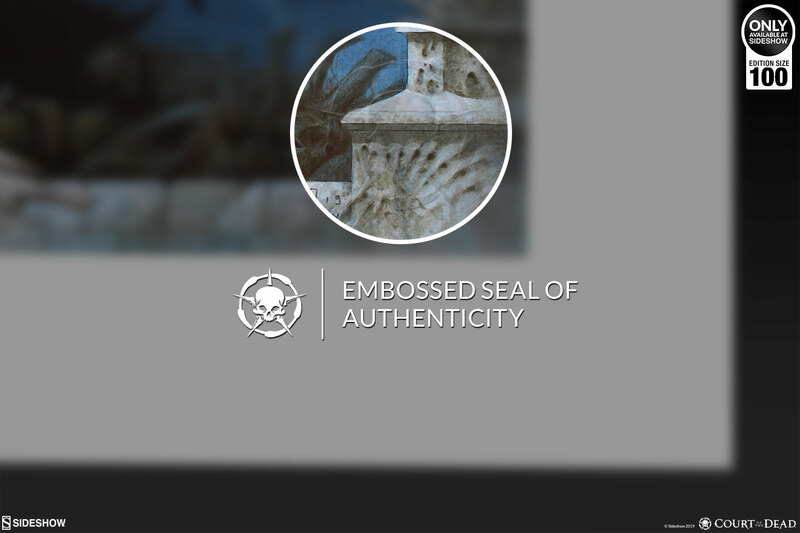 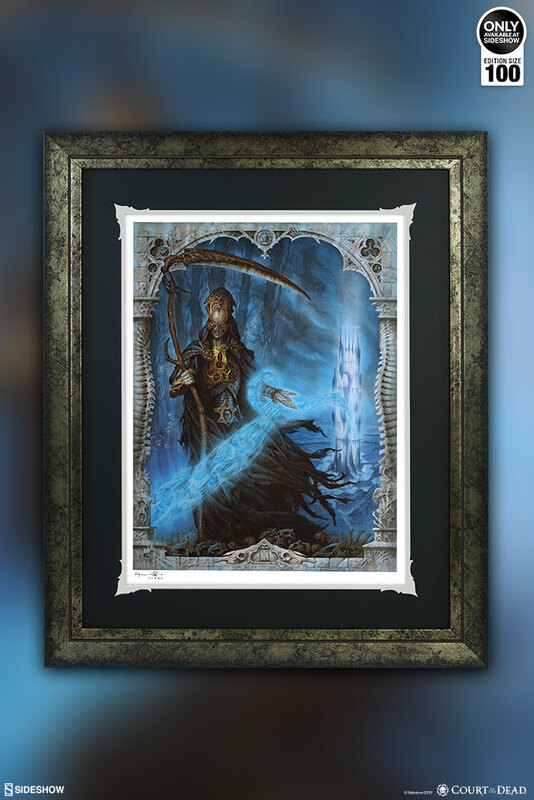 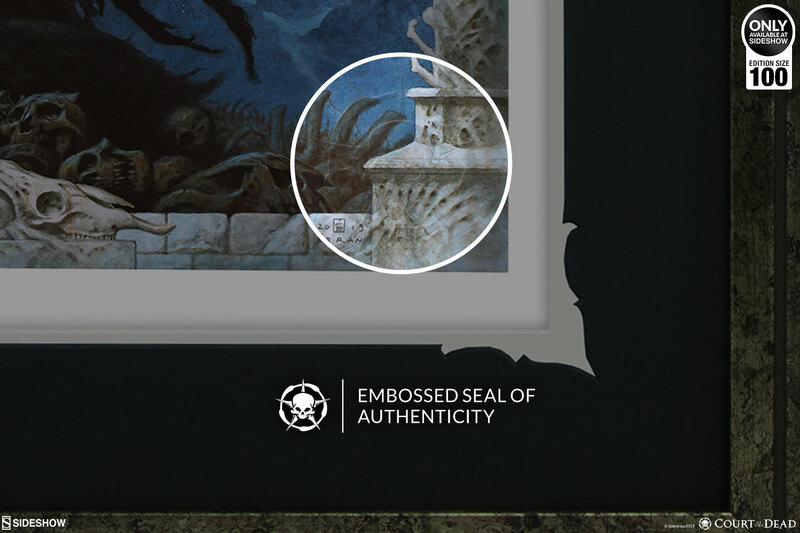 The framed edition fine art print includes a distressed silver frame and custom double mat design as well as a wire hanger for a complete display in your crypt of Underworld artwork. 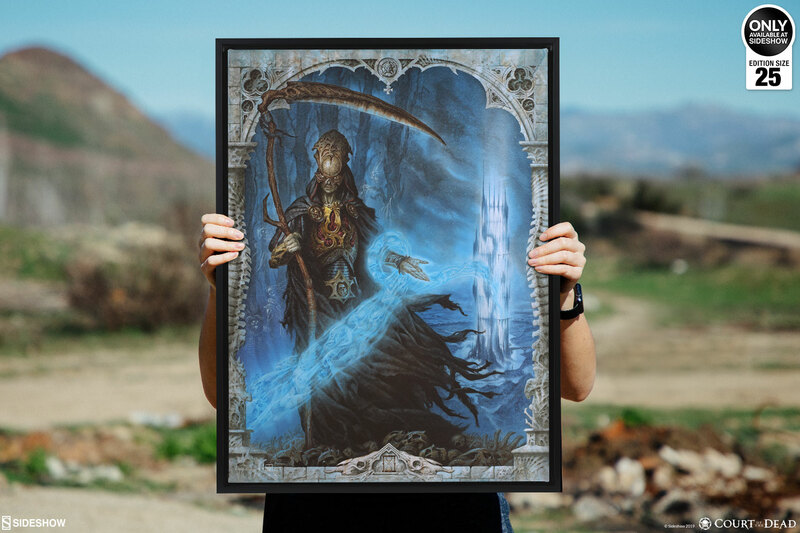 Let Ceran’s epic masterpiece guide you along an ethereal wave into the Underworld with the ‘Death Welcomes You’ Premium Art Print! 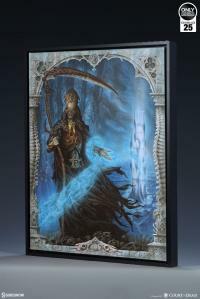 Sideshow presents the Death Welcomes You Gallery Wrapped Canvas from our original dark fantasy horror property, Court of the Dead. This fine art canvas brings the Underworld to your home in an incredible presentation worthy of the Dark Shepherd himself. 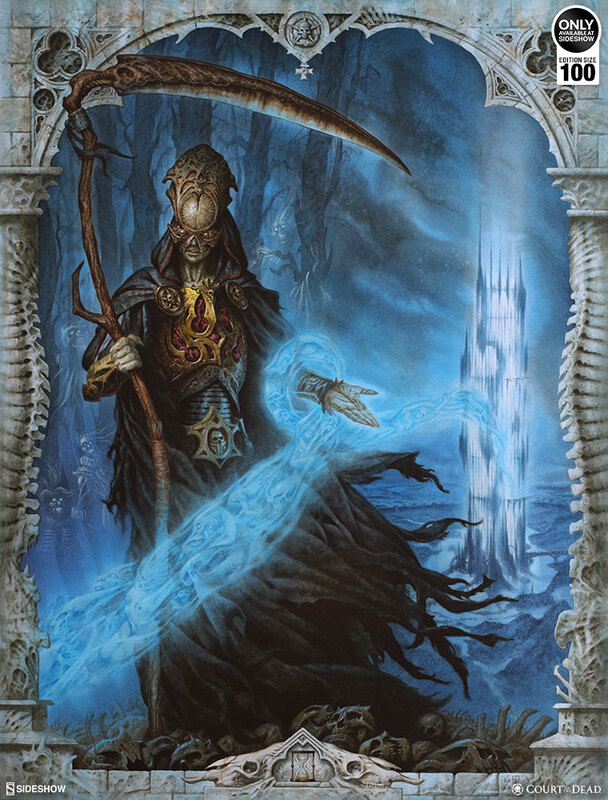 Painted traditionally by the talented Milivoj Ceran, the Death Welcomes You Gallery Wrapped Canvas depicts the Alltaker ushering a few fortunate souls into the Underworld, saving them from ending up as foot soldiers in the endless battle between the equally corrupt and power-hungry realms of Heaven and Hell. This bright yet moody masterwork features a unique border of Underworld architecture. 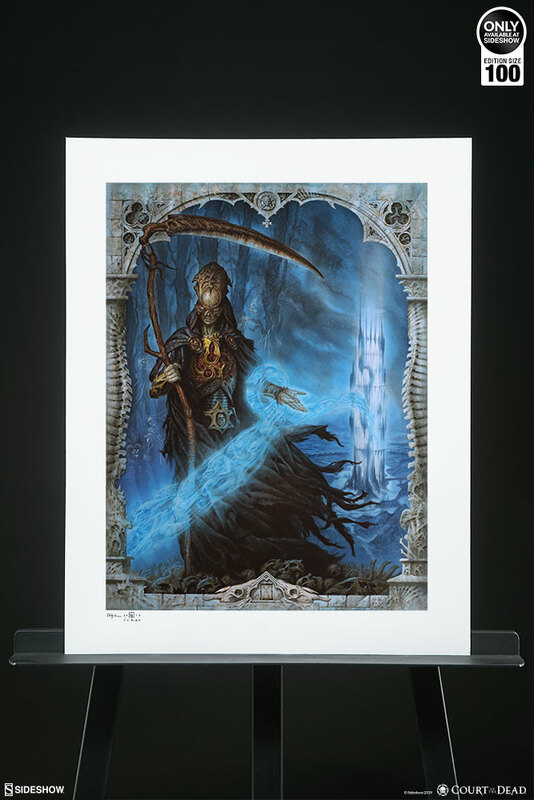 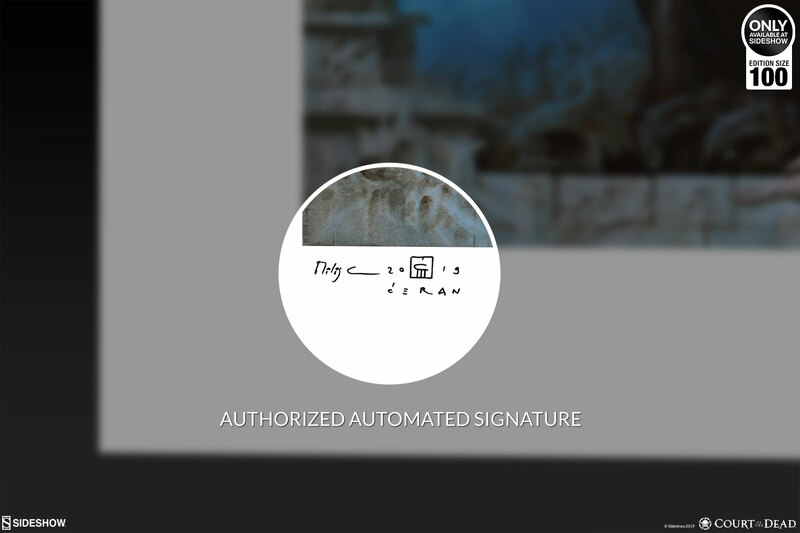 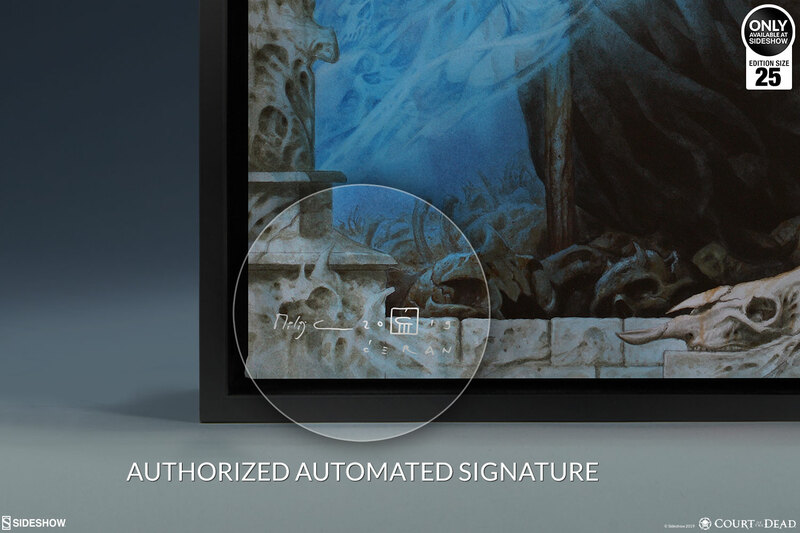 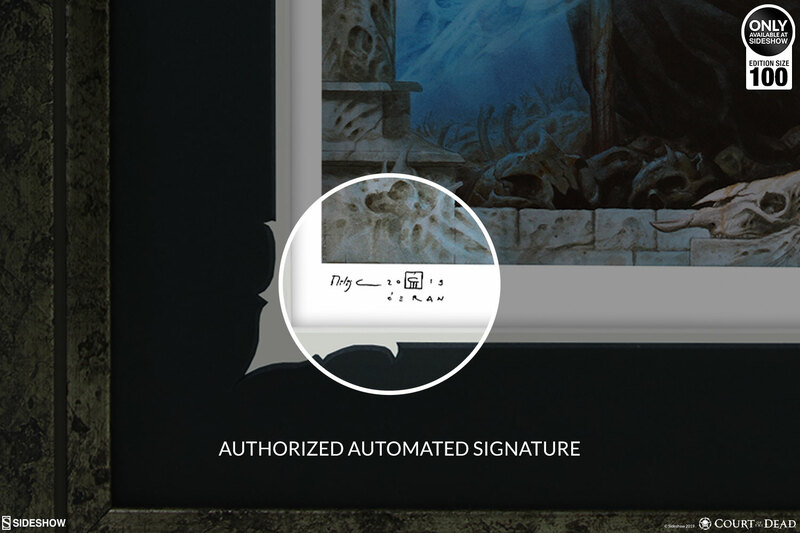 Every Death Welcomes You Gallery Wrapped Canvas features an authorized, automated signature in silver ink as a part of the limited edition of 25 pieces. 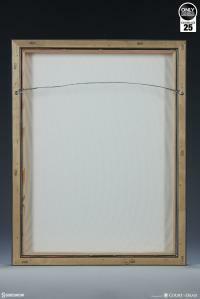 Each framed canvas art print comes ready to hang with a wire hanger and certified archival protective varnish for an easy and eye-catching display. 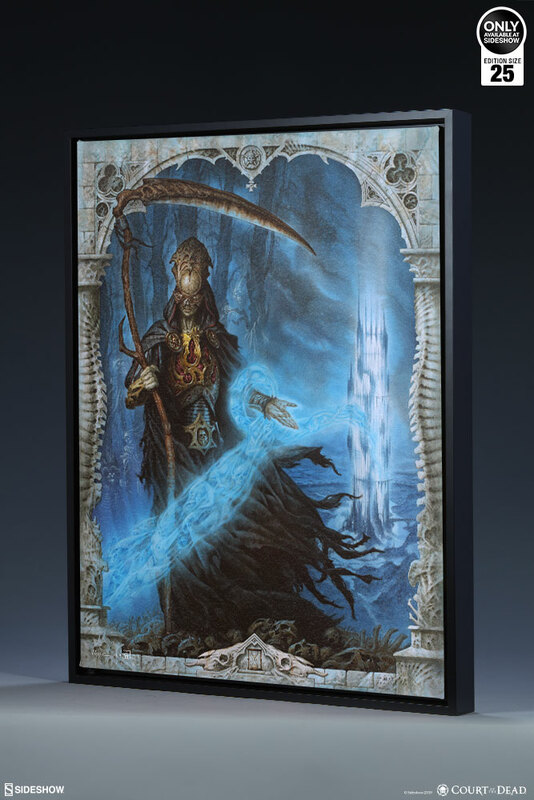 Let Ceran’s epic masterpiece guide you along an ethereal wave into the Underworld with the Death Welcomes You Gallery Wrapped Canvas!